Power is 2.5X with 4"x4 lens. An around the neck magnifying glass provides hands free magnification for reading, low vision and many crafts such as sewing, cross stitch, needle point and embroidery. For best magnification results a good light source is essential. 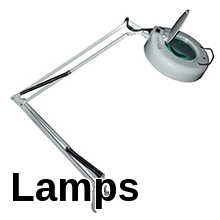 We sell lighted around the neck magnifiers and lighted hands free neck magnifying glass vision aids. Eliminate eye fatigue with our hands free around the neck magnifiers. Shop our buying guide for the best around the neck magnifier with light, hands free neck magnifier for needlework, hands free around the neck magnifying glass and magnifying glass that hangs around your neck. Neck magnifiers, reading magnifying glass around neck, neck worn magnifier, magnifying glass neck, over the neck magnifying glass and magnifying glass around neck magnifier are the same type magnifiers. What type of magnifying glass should I use? Magnifiers are available in many shapes, sizes and powers. 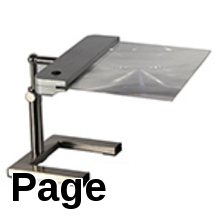 A hand magnifier is useful for short term use but for long duration use a hands free magnifier such as magnifying lamp, desk magnifier or table magnifier. Do I need a magnifying glass with light? A lighted magnifier will provide better magnification results as they provide a sharper and clearer image then a non-lighted magnifier. Our lighted magnifiers are either led or fluorescent lighted and provide a soft white light to ease eyestrain. Pay $8.00 postage for first item ordered. Free postage on all your next items. You may mix and match. Your postage will always be $8.00 per order(Domestic orders only). After the age of about forty you will experience a problem viewing small print and tasks involving close detail work. This eye condition is called presbyopia and magnification is the answer. Shop our large selection of magnifying glass for embroidery work and embroidery magnifying lamps. What type magnifier is best? Hand held magnifiers are best for short duration use and a embroidery magnifying lamp or hands free embroidery magnifier with stand are best for long duration use. those with presbyopia and macular degeneration. Field Of View: The size of the area being magnified when viewing through a magnifying lens. The higher the power of the magnifier the smaller the field of view. Diopter: Diopter is a measurement that is used to calculate the power of a magnifying lens. The higher diopter will provide higher magnification. Diopter is expressed as "D"
Power: Power is how large an object or print increases as you look through a lens. Magnifying power is expressed as "X"
Measurement from the center of the lens to to the object and be in focus. the magnifying lens to the object being viewed. Fresnel Magnifier: A flat magnifier consisting of concentric circles that can be a full page reading magnifier. Visual impairment (or vision impairment) is a decreased ability to see to a degree that causes problems not fixable by usual means, such as glasses or medication. 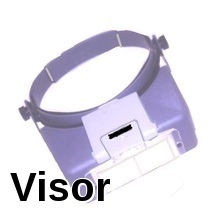 Our low vision magnifiers can be of help. The higher the power of the lens, the closer you must get to the object being viewed and the smaller the field of view. As the power of a lens increases the diameter of the lens decreases. Diopter is a term used to determine the power(magnification0of a lens. The terms are sometimes confused.